IWF -Ahead of SEC Nomination IWF Releases a "Binder of Women Candidates for High Office"
IWF RELEASES A "BINDER OF WOMEN CANDIDATES FOR HIGH OFFICE"
Isn't This What NOW Had in Mind? 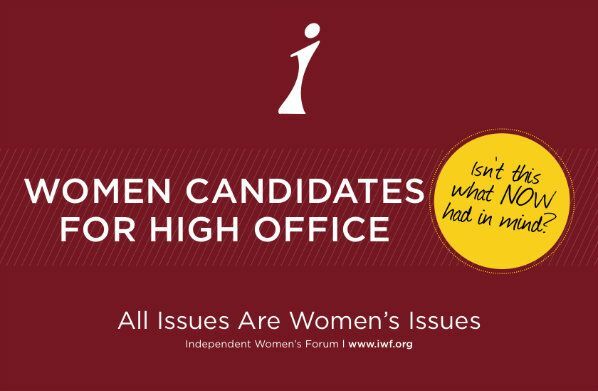 The Independent Women’s Forum today released a “Binder of Women Candidates for High Office,” – a 48-page file filled with highly qualified women that would be exceptional nominations for top leadership positions. Isn’t this what NOW had in mind? Unfortunately President Obama’s nomination of U.S. Attorney Mary Jo White is tainted with the question of whether it was done to satisfy liberal feminists, or because she’s really qualified for the job. Women shouldn’t be used as tokens to satisfy an obsession over gender parity coming from the left. Ultimately ideas and policy prescriptions should trump gender. We applaud Ms. White for her achievements, but we hope the president doesn’t consider such a narrow lens as gender sufficient for nominations. Ultimately we need to ask ourselves is full parity in government necessary for women to achieve full equality with men? Or should we instead be looking for a diversity of ideas and preferences in our government? IWF believes that the president should recruit qualified female candidates because they have the best experience and hold the right ideological values, not to reach an arbitrary goal of gender parity.